Beginnen Sie Ihre 2,5-stündige Dinner-Tour von Christchurch von Cathedral Junction aus, wo Sie die wunderschön restaurierte Christchurch Tramway besteigen. Professionelle Kellner bringen Sie zu Ihrem 2-Personen- oder 4-Personen-Tisch im klimatisierten Straßenbahnrestaurant, das maximal 36 Gäste fasst. Sie erhalten ein Begrüßungsgetränk, gefolgt von einem 4-Gänge-Menü, das mit einem saisonalen Menü zubereitet wird (siehe Beispiel in der Reiseroute unten). Kaffee- und Teeservice zum Dessert und alkoholische Getränke sind erhältlich. Entspannen Sie sich beim Essen, plaudern Sie mit Ihren Begleitern und genießen Sie die Sehenswürdigkeiten von Christchurch. Beispielmenü Bitte beachten Sie: Das Menü wechselt alle 3 Monate saisonal. Nachfolgend finden Sie nur eine Auswahl und möglicherweise nicht die Mahlzeit, die Sie am Tag erhalten. The experience was unique and a perfect thing to do when you have only 24 hours in Chrstchurch. The meal was superb. The accommodations on the Tram were equally excellent. Our only criticism was that there was a visual tour through the windows, but no audio. It would have benn nice to know what we were seeing. We do understand that they did not want to ruin the "dinner' mood; but a little audio would have worked just fine. We enjoyed a lovely 3 course dinner on this charming tram. The food was tasty and the staff was friendly and accommodating. It was a nice opportunity to see the sights of Christchurch. The only downside was making the same figure 8 loop multiple times seeing the same sites and there was no commentary about where we were or what we were seeing, which is given on the regular Tramway Tour (non-dining cars during the day). We sat with 3 other parties in the car and ended up seeing one of the couples in the following days on other tours. It was a hoot. Must reserve in advance as this can sell out! If staying in Christchurch and want to see it, I would suggest this lovely pleasant trip on an old Aussie tram. The food and service was amazing and great, the two ladies looked after us, and even the chef had a bit of fun. Everything about the tram is lovely. Meals were nice and you have a choice, wine or alcohol you pay extra. Once Christchurch recovers from that awful earth quake, it will once again be the gorgeous garden state in New Zealand, a tad depressing, but like I said the tram trip was GREAT. It was a perfect ending to our almost four week tour of New Zealand. We always try to end our trips with a special last evening dinner. This one was unique traveling around Christchurch in a beautifully restored vintage trolley with a classic wood paneled interior. I have a fondness for antique vehicles and machines, so the trolley was of particular interest for me. We love watching the sky darken and city lights come on at dusk - the evening trolley was a wonderful venue for that. The food was delicious and the wait staff attentive. They even went out of their way at the tour's end to phone for a taxi for us and took us to the pick-up spot and waited until the cab came. 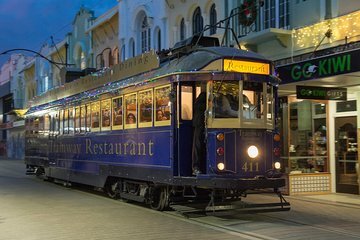 For a unique dinning experience in an attractive setting, take the evening trolley tour in Christchurch. When I was booking our trip to NZ and Christchurch, I couldn't help but notice this tram dinner tour. Gee, that looks like fun. So I book it about four months in advance. We fully expected the food and wine to be mediocre, the prime feature of the tour being aboard a tram winding its way through downtown Christchurch. What a surprise! The Tram is restoration work of great skill and love for the history of trams in NZ. The actual tram car may be from elsewhere Australia?, but completely authentic with the touch of artisan craftsmen's careful restoration. But then there is the food, wine and, most outstanding, the service! I apologize for not remembering names because the on-board service crew are few and exemplify the easy going kindness and friendliness of Kiwis everywhere. They certainly made the event one to remember! The food and wine were superb we highly recommend the wine pairing. The dishes, prep and presentation, are worthy of fine restaurants worldwide. As I said, What a Surprise. Do this full throttle, you won't regret it. 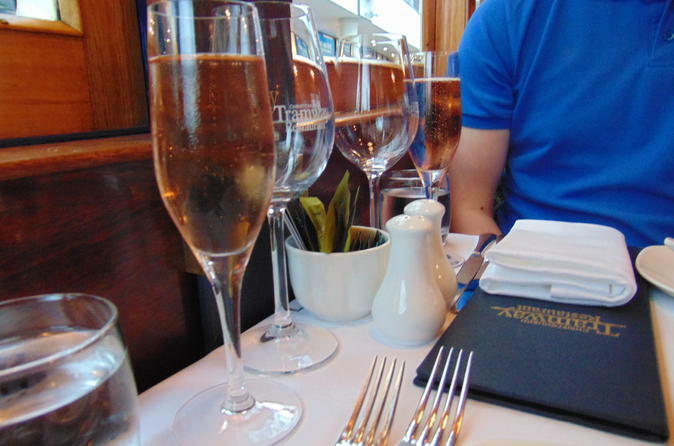 The food and wine was amazing, the staffs were nice except the driver, he was so rude……….………1 star deducted cos of him. A great tour of Christchurch. Awesome food - a great way to see the city. Would recommend this to all our friends. Was ok , but they have been too many times the same route . Food was fantastic. There is a lot of repeat in the journey and drinks are an additional cost apart from the welcome drink.